Biblical creationists have been at the forefront of efforts to educate the public that the concept of separate human ‘races’ has little basis in biology.1,2 The Bible tells us that we are all descendants of Noah’s family, some 4,500 years ago. From this it can be reasonably concluded that all humans are closely related; in other words, very similar genetically. Indeed, the same main substance—a dark brown pigment called melanin—colours the skin of all humans.3 Individuals that have a lot of it appear to have ‘black’ skin; people that have little appear ‘white’. Melanin is produced by organelles called melanosomes, contained in special cells called melanocytes. Melanocytes are located in the bottom layer of the skin, and produce melanin with the aid of tyrosinase and other enzymes. People with lighter-coloured skin have smaller, fewer and less dense melanosomes than darker-skinned people. Skin colour, like many other human traits, varies in almost continuous fashion throughout the spectrum from very pale to very dark. While (eu)melanin functions in protecting the skin from the damaging effects of exposure to the sun’s UV rays, it also apparently protects folate, an essential vitamin particularly important for neural tube development in the unborn.7 Melanin also protects those living in lowland equatorial regions from tropical skin ulcers through an anti-microbial effect.8 So people with good levels of melanin are better adapted to living in the tropics than people with little melanin. On the other hand, melanin reduces the production of vitamin D, a vitamin essential to normal bone development that is manufactured in the skin on exposure to sunlight. Consequently, people with dark skin tend to suffer from rickets at high latitudes, where the skin’s exposure to sunshine is lacking, unless their diet is rich in vitamin D (by eating fish, for example, as the Inuit do). In such areas people with little melanin (’whites’) are better adapted. These factors have undoubtedly contributed to the distribution of skin colours in different regions around the world. Other substances, such as the coloured fibres of the protein elastin and the pigment carotene, affect skin shading in minor ways. Humans also share these compounds in varying degrees. Other factors may influence the shade perceived by the observer in subtle ways, such as the thickness of the overlying (clear) skin layers and the density and positioning of the blood capillary networks. Skin colour, like many other human traits, varies in almost continuous fashion throughout the spectrum from very pale to very dark. Racial discrimination on the basis of skin colour is about as irrational as discrimination based on height, finger length, or any other continuously varying trait—indeed, discriminating on the basis of blood type makes more chemical sense, a reduction ad absurdum of racism. However, little is understood about the genetics of skin colour in humans. Study of some forms of albinism, where people with certain mutations cannot manufacture any melanin, showed that the enzyme tyrosinase, which processes the amino acid tyrosine, is important in the manufacture of melanin. However, mutations in the tyrosinase gene have nothing to do with the normal variations in human skin coloration; albinism is associated with serious eyesight problems, for example. A large team of researchers centred on Penn State Cancer Institute found a gene in zebrafish that affects the shade of the dark stripes in the fish’s coloration, causing the golden variant. A mutation in the slc24a5 gene was found to reduce the amount of melanin in the dark striped areas, resulting in a paler colour (see figure 1).9 The mutants had fewer and smaller melanosomes, which also contained less pigment. This parallels the situation in pale-skinned humans, who also have fewer and smaller melanosomes, so the researchers wondered if the same gene could be involved. In an elegant piece of multi-disciplinary team work, the researchers showed that a homologue of the zebrafish gene accounts for some 25–38% (95% confidence limits) of the variation in human skin colour between northern Europeans and Africans. A single nucleotide differs between Africans and Europeans in the gene, SLC24A5. This results in one amino acid difference: residue 111 is alanine (Ala) in Africans and threonine (Thr) in Europeans. There is a high degree of homozygosity in Europeans for the Thr variant, the A allele, with a frequency ranging from 98.7–100% in several European-American populations sampled. The Ala version, the G allele, ranged from 93–100% in various African, native American and East Asian population groups. This distribution is quite non-random, suggesting strong selection has been applied to the alleles. This selection could be environmental, but is more likely to be sexual, i.e. due to marriage preferences arising from recognition of the benefits of dark skin in tropical areas and light skin in high latitude areas.10 This would have happened after the Babel population bottleneck, when God forced the people after the Flood to spread out and ‘fill the earth’, as he had commanded Noah. Japheth, or his wife, might even have carried the A allele. It would be interesting to know the frequency of the A allele in the Caucasian people of India, whose skin colour ranges to quite dark. Does the frequency of the A allele decline with darker skin amongst these people? Interestingly, East Asians and native Americans share the African G allele, so this gene has nothing to do with the lighter skin of these people compared to Africans; other genes must be involved here. That most of the world’s population carries the G allele suggests that this was the genotype of the first humans and that the European A allele arose as a single mutation after Creation. This does not mean that Adam and Eve were necessarily ‘black’, because other genes influence skin colour (as in East Asians, for example). Evidence from a study of recently admixed (African + European) populations suggests that the European A allele is partly dominant over the G allele. This means that the AG genotype has skin colour intensity more like an AA than a GG. 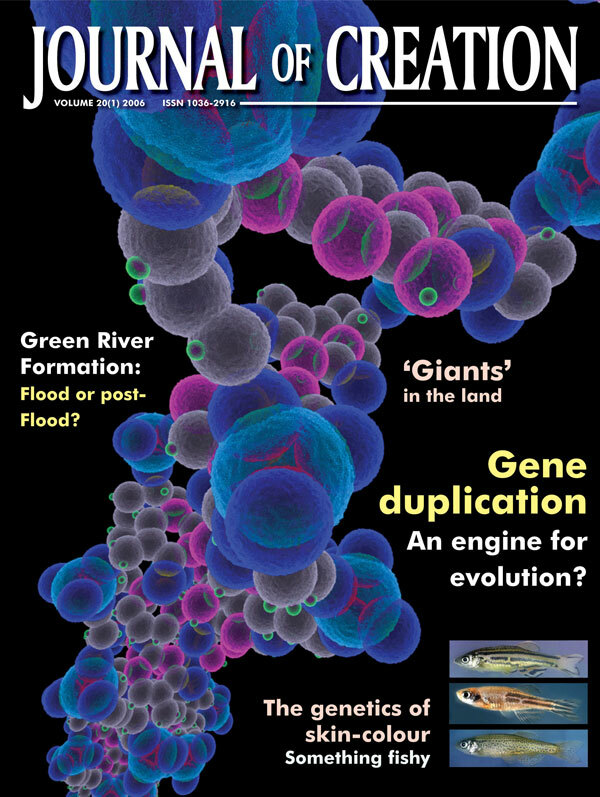 The paper implicitly assumes the evolutionary story that the human gene originated in some common ancestor with zebrafish. The human and zebrafish genes are so similar in function that the human gene (allele G) activated normal melanin production in zebrafish that have the mutant gene (golden). So, although the authors found about 69% homology in the amino acid sequences, it seems that the differences do not affect function much, as least in the reverse direction. However, it could be that the human gene is more specialized in some way, such that the zebrafish gene would not work properly in humans. The human gene codes for 500 amino acids. All genes investigated in various taxons had about the same number of amino acids and all apparently had eight introns in the same positions.11 The intron sequences were not discussed. Given the supposed timescale (supposedly some 400 Ma) for such conservation, it seems more like a just-so story—especially considering how much ‘evolution’ (the materialists’ unseen ‘creator’) has supposed to have achieved in that time. However, this work contains valuable data that is relevant to the phenomenon that has been called ‘race’, showing how little genetic difference there is between various people groups (one amino acid in this case), even differences that superficially look significant, such as skin colour. Bergman, J., Evolution and the origins of the biological race theory, Journal of Creation 7(2):155–168, 1993. Return to Text. Bergman, J., Darwinism and the Nazi race Holocaust, Journal of Creation 13(2):101–111, 1999. Return to Text. 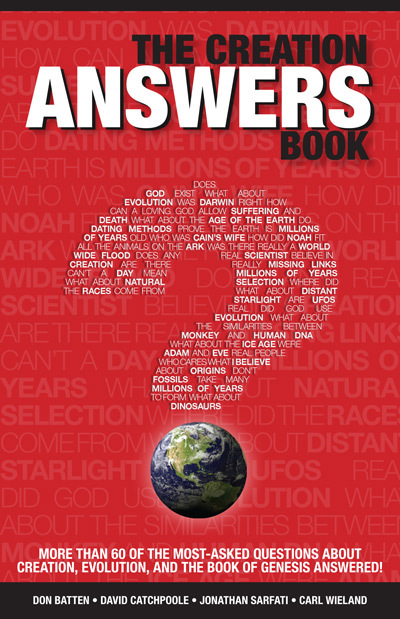 Batten, D., Ham, K., Sarfati, J. and Wieland, C., The Answers Book, chapter 18, Creation Ministries International, Brisbane, Australia, 1999. Return to Text. Cohen, P., Redheads come out of the shade, New Scientist 147:18, 1997. Return to Text. Bastiaens, M., ter Huurne, J. et al., The melanocortin-1-receptor gene is the major freckle gene, Human Molecular Genetics 10(16):1701–1708, 2001. Return to Text. Ranadive, N.S., Shirwadkar, et al., Effects of melanin induced free radicals on the isolated rat peritoneal mast cells, J. Invest. Dermatol. 86:303–307, 1986. Return to Text. Jablonski, N.G. and Chaplin, G., The evolution of human skin coloration, J. Human Evol. 39(1):57–106, 2000. Return to Text. Mackintosh, J.A., The antimicrobial properties of melanocytes, melanosomes and melanin and the evolution of black skin, J. Theor. Biol. 211(2):101–113, 2001. Return to Text. Lamason, R.L. 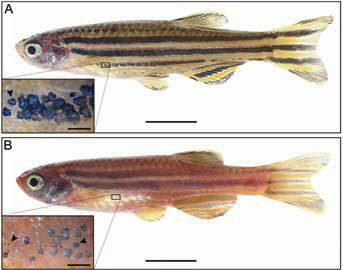 et al., SLC24A5, a putative cation exchanger, affects pigmentation in zebrafish and humans, Science 310:1782–1786, 2005. Return to Text. Batten et al., ref. 3, pp. 216–219. Return to Text. Supporting online material for Lamason, R.L. et al., SLC24A5, a putative cation exchanger, affects pigmentation in zebrafish and humans, Science 310:1782–1786, 2005; www.sciencemag.org/cgi/content/full/310/5755/1782/DC1. Return to Text.